Recommendations for the survey planning based on evaluation of resolving capability of the seismic method for any given geologic scenario and acquisition geometry. Endorsement for seismic data processing workflow basing on modeling of any type of seismic records such as conventional surface seismic, micro-seismic, VSP, and high frequency well log simulation. Verification of robustness of any given seismic interpretation for reality of the reflected discontinuities and structural elements. Identification of potential processing artefacts not tied with the medium model structure that may lead to interpretive errors. Estimation of horizon illumination under lateral heterogeneities using ray-tracing approach. The wavefield time slice (snapshot) analysis allows visualize the particle displacement velocity for Z, X, Y, and hydrophone components of the propagating wavefield, and to easily distinguish the down going and the reflected waves of various types. AVO-modeling or anisotropic, porous, fluid saturated, visco-elastic, thin layered media, and curved boundaries complicated by changing physical properties both vertically and laterally. Demonstration data sets for geophysical software evaluation and development. Allowing the user to fully understand the strengths and weaknesses of the new technologies so that the adoption cycle time may be greatly reduced. Presentation (report, training course) enabling a clear understanding of the complexities of seismic signal mode conversion, multiples, the creation of surface related noise, etc. Model Building allows to quickly build on screen model of geological cross-section incorporating different rock properties and levels of structural complexity. You can integrate well-logs and other available data at interactive Model Building. Practically any kind of geological structure can be simulated and complex patterns of P-wave and S-wave velocities, densities, anisotropy, fracturing and energy absorption can be applied. Tesseral Pro Release 5 is now available! Tesseral Geo Modeling suite has a toolbox of seismic data processing capabilities including velocity analysis, CDP stacking, pre-stack time and depth migration, time and depth VSP migration, and AVO-modeling. Seismic modeling of plausible geological scenarios for particular area allows selecting optimal acquisition geometry and processing workflow basing on analysis of produced synthetic data. Tesseral 2D is a highly interactive and easy to use visual learning tool for students and professional geophysicists alike. It can help geoscientists to better understand wave processes in geological media and the specifics of the seismic exploration methods. 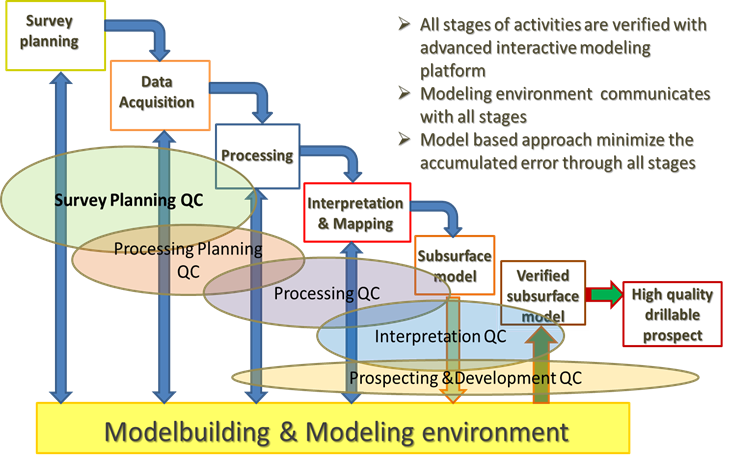 Articles related to using in Tesseral Geo Modeling suite methods and application case studies . Forward modeling demonstrates how inadequately removing groundroll can result in erroneous and more difficult interpretations. In many cases, seismic attributes exacerbate the effects of this noise. Forward modeling shows that improper velocity analysis can create patterns that even experienced interpreters could perceive as geology. Seismic velocity model of the crust and upper mantle along profile PANCAKE across the Carpathians between the Pannonian Basin and the East European Craton.